Grant Recipients: 1st row: Director of Community of Schools and PEAC Initiatives at PEAC (Program for Effective Access to College) Patricia Madrigal; Domestic Violence Solutions Executive Director Charles Anderson; AHA! 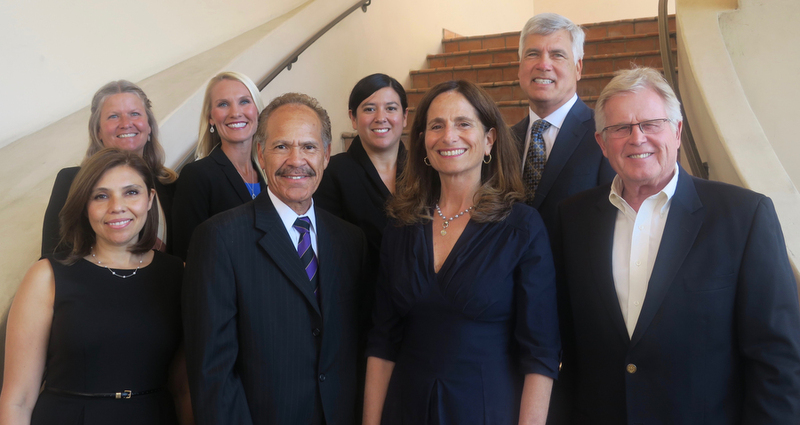 Executive Director Jennifer Freed, Casa Pacifica CEO Steven Elson; 2nd row: Youth and Family Services, YMCA Executive Director Valerie Kissell; Adams School Principal Amy Alzina (Accelerated Reader Program); St. Vincents CFO and COO Rosa Paredes; and Peoples' Self-Help Housing President and CEO John Fowler. 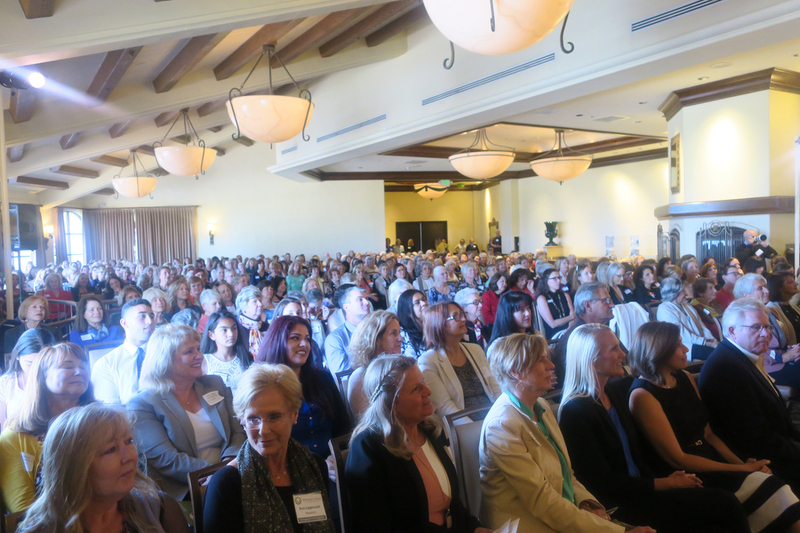 On May 8, 345 members and guests of the Women’s Fund of Santa Barbara gathered for the 13th annual Presentation of Grants Reception at the Fess Parker Doubletree hotel. Grants totaling $485,000 were distributed to area nonprofits for eight programs: the Accelerated Reader Program, AHA! (Attitude, Harmony, Achievement), Casa Pacifica, Channel Islands YMCA (for Noah’s Anchorage), Domestic Violence Solutions, PEAC (Program for Effective Access to College), Peoples’ Self-Help Housing, and St. Vincent’s. 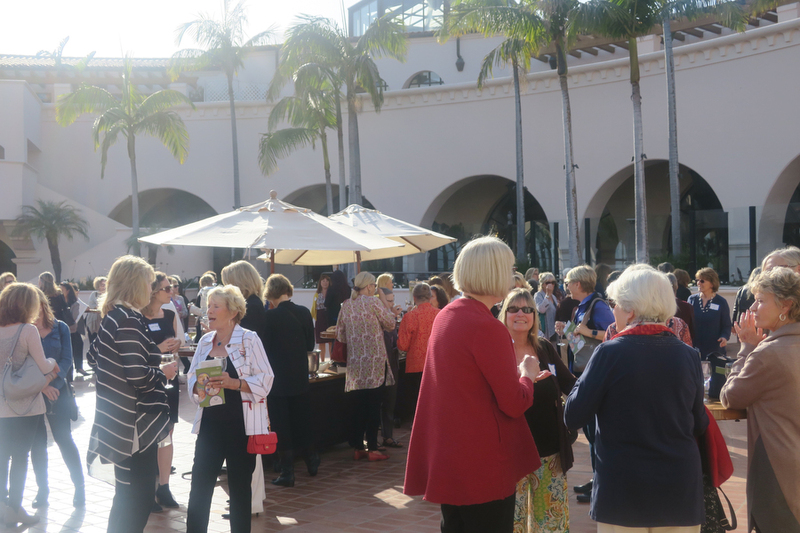 An all-volunteer, collective donor group with about 750 members, the Women’s Fund combines the donations of its members into significant grants focused on the critical needs of women, children and families in south Santa Barbara County. The organization holds no fundraisers, all funds come from member contributions. Over the course of nearly a year, its Research Committee conducts in-depth research of programs of area nonprofits and submits a ballot of finalists to the general membership for a vote on the ultimate grantees. In the presentation to the members and guests, Steering Committee Co-chair Nancy Harter explained that “we give large grants, frequently for programs that wouldn’t be funded by others . . . We are flexible, funding start-ups, established programs and capital projects, and we look for ways to leverage our investments.” Research Committee Co-chair Irene Stone noted that unlike many grant making entities, the Women’s Fund does not accept unsolicited applications. Rather, organizations are invited to submit applications. 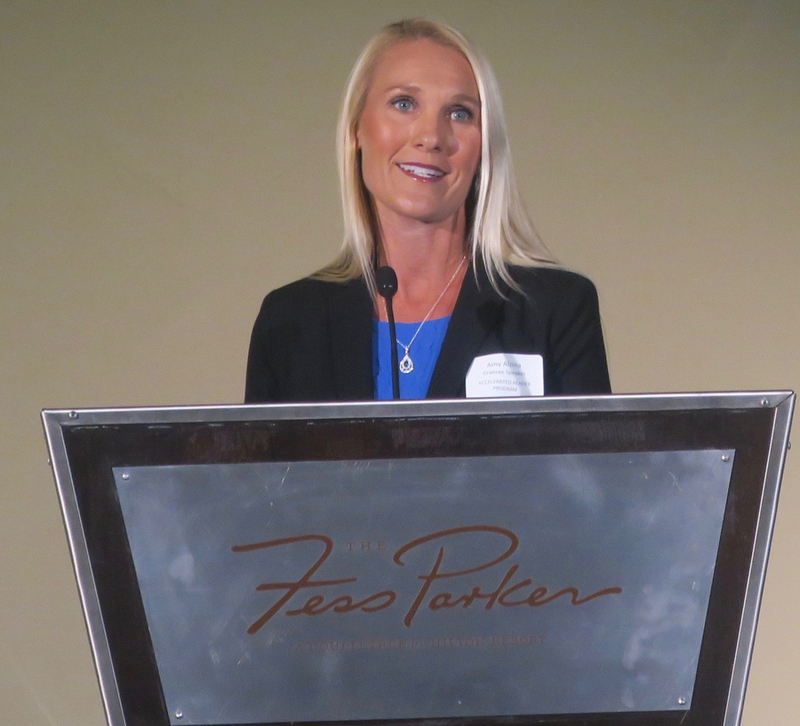 Each grant recipient gave a short acceptance speech, with many of them sharing stories of individual clients served, stories that poignantly demonstrated the needs in the community and how their organizations are serving those needs. A lovely reception in the Rotunda followed. At another gathering in the fall, members will hear reports from the grantees on the use of their funds and later have the opportunity to visit the nonprofits in small groups. Since its founding in 2004, the Women’s Fund has made grants totaling more than $6 million. Membership in the organization is open to any woman; women can join as individuals or as a group. While limited volunteer positions are available, membership requires only a financial commitment. For more information, go to womensfundsb.org. Accelerated Reader Program – $25,000 to improve reading proficiency by expanding libraries in K-3 classrooms in the Santa Barbara Unified School District. AHA! (Attitude, Harmony, Achievement) – $70,000 to expand the Peace Builders program to prevent bullying at three additional junior high schools. Casa Pacifica – $75,000 to expand rapid mobile crisis weekend response for children and youth experiencing a mental health emergency. Channel Islands YMCA, Noah’s Anchorage – $65,000 for upgrades in facilities and furnishings to meet new state accreditation requirements. Domestic Violence Solutions – $55,000 to replace old playground equipment with a safe, inviting play system for children fleeing domestic violence. PEAC (Program for Effective Access to College) – $75,000 to expand Summer Bridge programs to La Colina and Goleta Junior High Schools and Dos Pueblos High School and to partially fund tutors and mentors at the Dos Pueblos PEAC Tutoring Center. Peoples’ Self-Help Housing – $60,000 to establish onsite learning centers, providing bilingual tutoring and coaching at two new low-income housing projects. St. Vincent’s – $60,000 to address legal problems and expand parenting education for single mothers transitioning to jobs and permanent housing. Send event invites to Gail at society@independent.com. 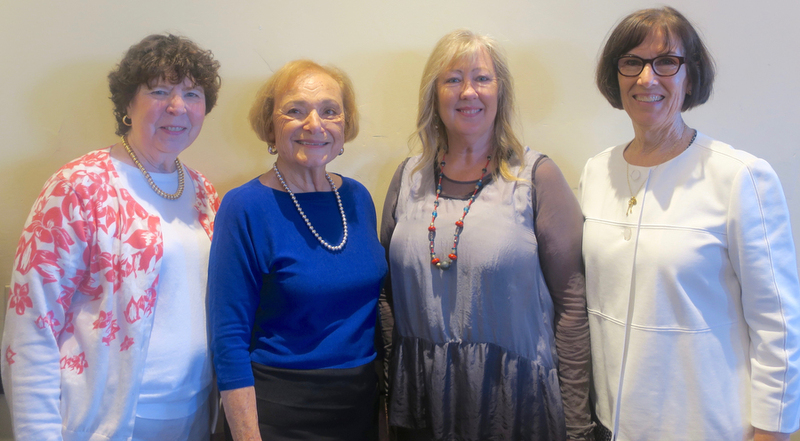 Steering Committee Co-chair Laurie Tumbler, Research Committee Co-chair Irene Stone, Research Committee Co-chair Mary Genis, and Steering Committee Co-chair Nancy Harter. 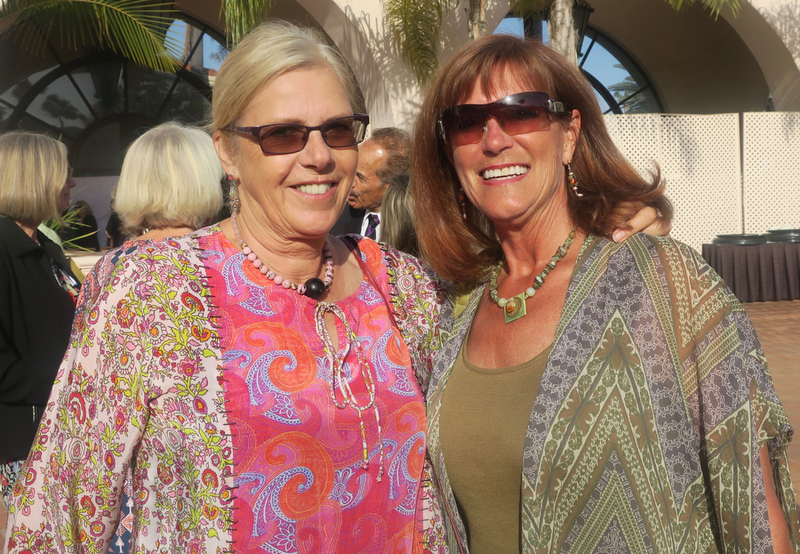 Incoming Steering Committee Co-chair Shelley Hurst and Presentation of Grants Event Chair Carrie Spiegle Lundquist. 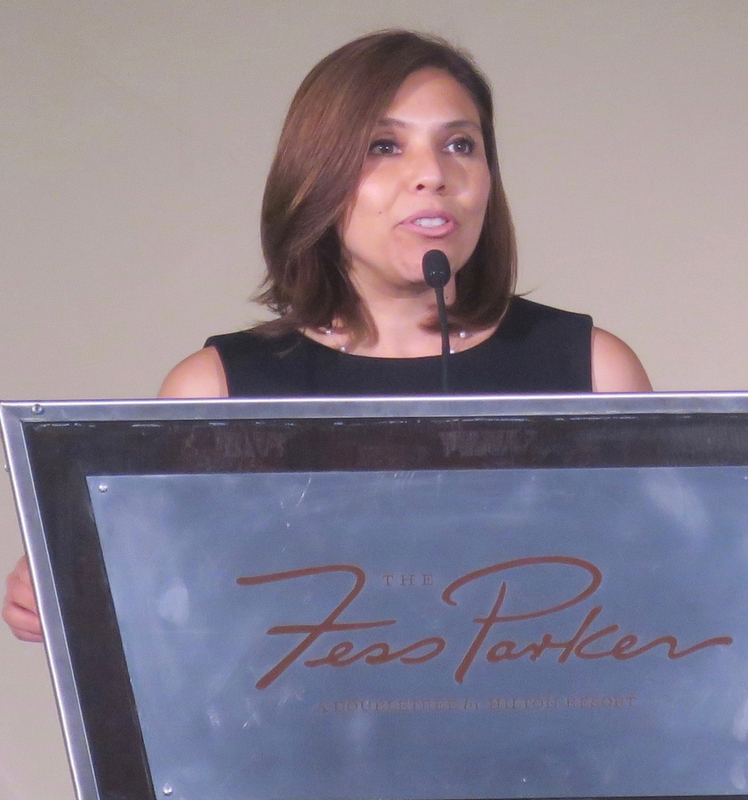 Director of Community of Schools and PEAC Initiatives at PEAC (Program for Effective Access to College) Patricia Madrigal. Guests listen to the program. 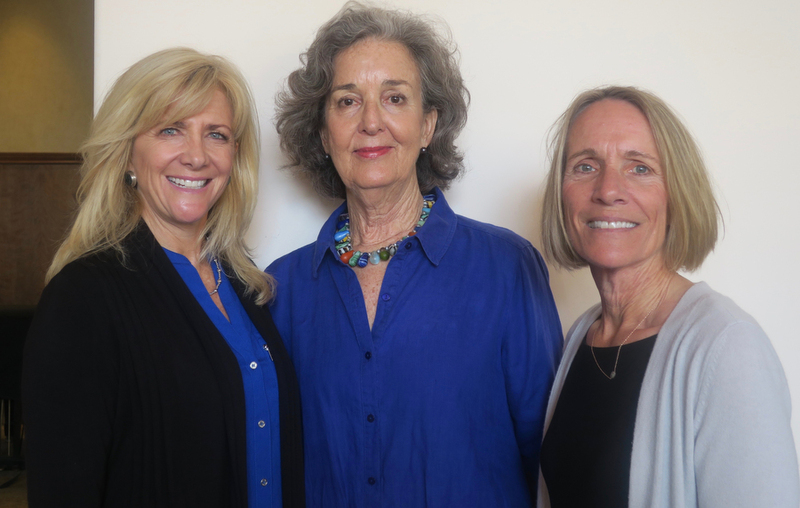 Steering Committee Members Melissa Gough, Sally Coughlin, and Susan Robeck. 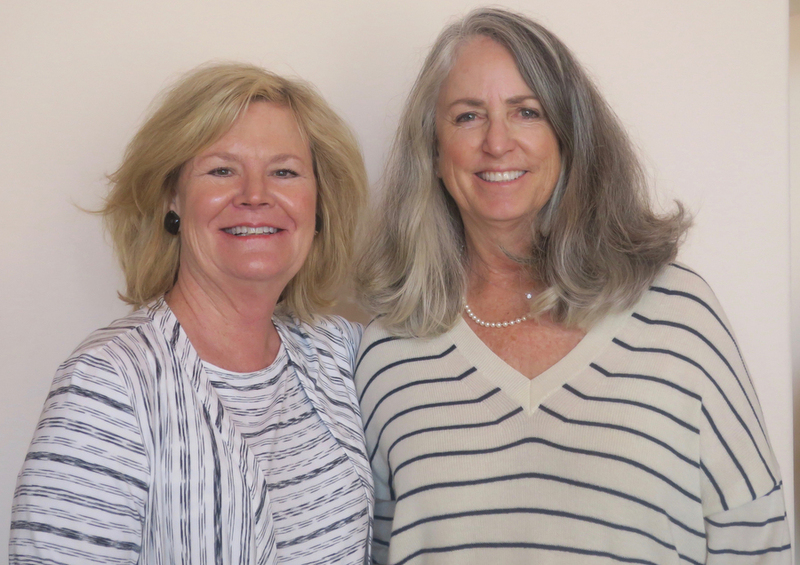 Women's Fund members Christina Leveque and Kate Winn-Rogers.